Heat oil in skillet. Add garlic and cook over medium high heat, 1 min. Add tomatoes and oregano and simmer rapidly, stirring occasionally until thickened, 15 min. Add S&P. Meanwhile, cook pasta. Toss pasta with sauce. Place half of pasta in an oiled 9×13” dish. Cover with half parmesan and half mozzarella. 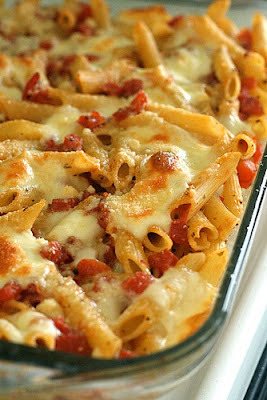 Top with remaining pasta, then parmesan and mozzarella. Bake at 400° for 15 minutes.